Grey water is best described as your used bath, shower or washing machine water. Up to 60% of household water consumption is discharged as grey water. Considering that a household typically consumes 150-200 litres of water per person per day, this can amount to 400-600 litres per day per household. This water can be safely used for irrigation and other uses. It hould not be discharged to sewer where it contributes to overloading sewer systems and wastewater treatment plants, using more energy and resources to treat. 40mm PVC inlet, outlet and overflow fitings. 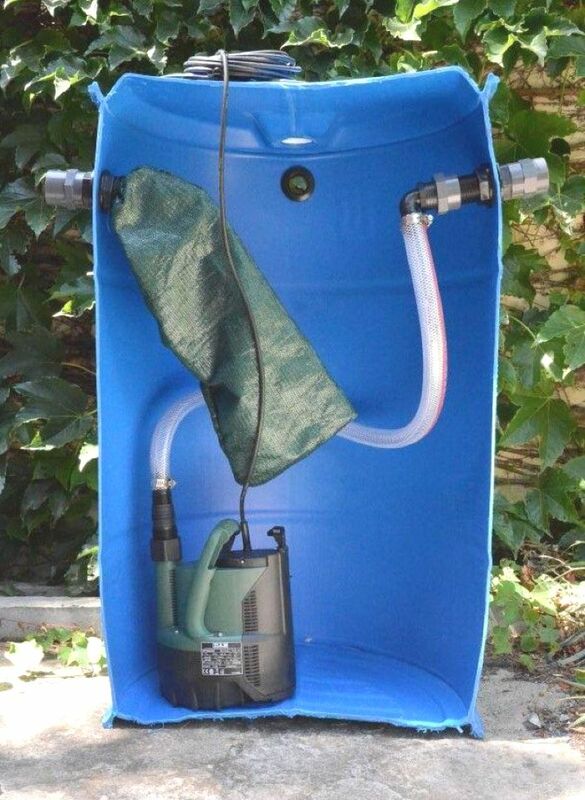 Grey water is easily collected in the pump sump from where it can be pumped directly into your garden or holding tank. The pump has a float switch for automatic control. A mesh bag, catches all the hair and solids, which may lead to blockages downstream. This needs to be cleaned periodically. Separate your grey water drainage from your black water. Install the Composta Pump Sump at a convenient location so that you can connect the various grey water drains into the sump. Drains should flow freely under gravity and there should be no standing water in the pipes as this will lead to blockages over time. Bare in mind that you will also need a power point near the sump when you choose its location. Your plumber or builder can assist with locating and installing the sump. 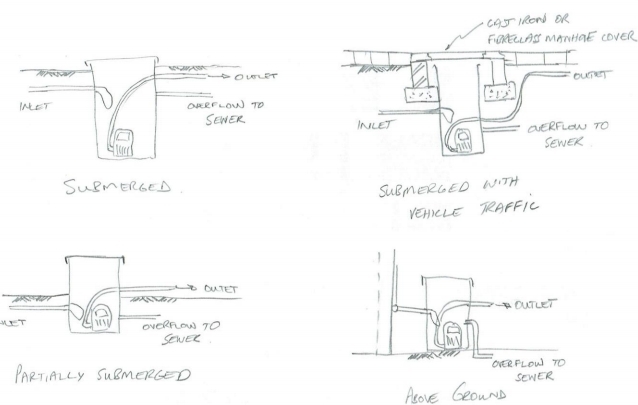 Connect the sump overflow pipe to a sewer so that it can overflow safely in the event of a power or pump failure. The overflow should be installed slightly below the inlet level so that water does not back up into your drainage system. 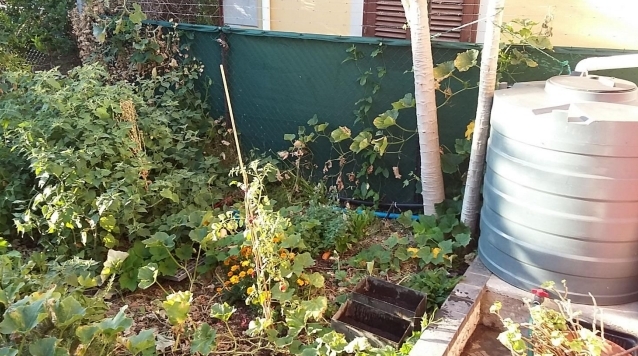 Connect the pump outlet pipe to a hose feeding your garden or a holding tank. Storing grey water for any period of time can lead to the formation odors – these are not harmful and dissipate quickly during irrigation. We recommend against any kind of spray irrigation as this will exacerbate any odor problem and serve to get any pathogens that may be present airborne. Rather use some irrigation pipe with holes drilled into it to distribute your grey water into the garden. 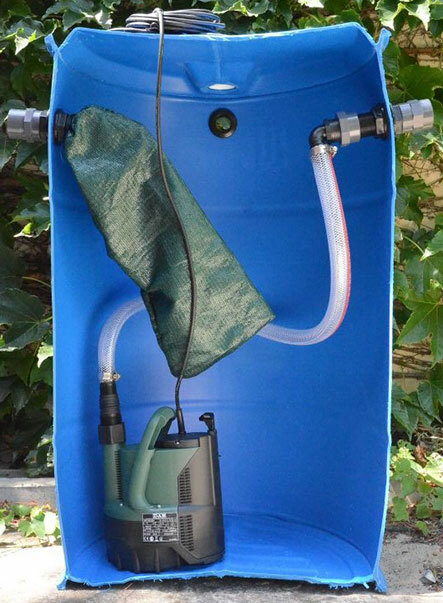 Install the filter bag over the inlet to catch any solids with may clog the pump or the irrigation system downstream.